In the blink of an eye, we’ve reached the finish line of our regular race season! Four consecutive weekends of that non-stop pop-pop and stainless steel - led to a homecoming with more hardware than any other team in the conference. In case you’ve missed the story on our Instagram, here is a short recap of our 2019 race season. Kicking off the season, we visited Sugar Mountain near Boone, NC to claim the throne in the USCSA Southeast Conference. We had a strong team showing, scoring 1st place in men’s ski slalom, women’s ski slalom, women’s ski GS, men’s ski GS, and women’s snowboard GS. Not a bad start! Run it back! Just the very next weekend, VASST claimed first in women’s ski slalom, women’s snowboard slopestyle, women’s ski GS, women’s snowboard GS, and men’s snowboard GS. Also, a HUGE thanks goes out to the parents for coming out and hosting a tailgate for all our athletes! We’re in the thick of the season now and the going’s getting tough. Every team is in game mode and everyone is gunning for the top spot. We prevailed however, stealing 1st in men’s ski GS (day 2), women’s ski GS (both days), men’s snowboard slalom, women’s snowboard GS, and women’s snowboard slalom… I guess the tough got going. Rounding out our season was our second weekend at Bryce. This was costume weekend, hence the onesie extravaganza sweeping the mountain. We came away with 3 and 4 top 10 finishes for men’s and women’s ski slalom, respectively, along with the top 4 individual scores for women’s snowboard rail jam and a total of 6 finals appearances by hoos in their respective cross event. Again, thank you to the parents who came out to Bryce 1 and Bryce 2!! Thank you everyone for staying with us through the 2019 race season! Shout out to the about-to-be graduates, executive board, parents, and USCSA for making it all possible! See you next year! This past weekend was Homecoming Weekend, and what better way to welcome all Alumni back to grounds than some great pancakes (for a great cause too)! Just as tradition, VASSTers volunteered to flip some of the steeziest pancakes. Hanging out with old friends, making new ones, and eating up while raising money for the a good cause… Is there any better way to kick off the weekend?! VASST is back and more active than ever before! This time the squad rolled up to Humpback Rock for an early Sunday morning sunrise hike. Even though the clouds managed to block the sunshine, they couldn’t block the friendships and memories from forming :) At the top, Ben Manlapaz (photographer) was really nice and took drone pics for us! After the hike, we all had a nice Bodos breakfast as well. What a great start to the day! We started 2018 off with our annual pilgrimage up to Sunday River in Bethel, Maine, where we spent a week training with Gould Academy, shredding some pow, and getting hyped for another semester of Vasst. Our first race of the season was a huge success, with both men and women skiers placing 2nd in the slalom event as well as GS for the men, and women sweeping 1st for the GS the following day. As for the boarders, our ladyboarders came in hot and claimed their first win of the season in the GS event, and manboarders earned 2nd. Instead of sandy beaches and waves and sun, going to the "Beech" for our second race weekend entailed another trip down to North Carolina in January. Our men and women skiers both came in 2nd in the GS event, with men coming in 2nd in slalom and women in 3rd. Our manboarders came in 4th in both the Slopestyle and GS events, while our ladyboarders won both (!!!). Our one-woman-slopestyle ski team, Alex Oberg, also competed and earned 5th all by herself! Our first Virginia race of the season was a blast, particularly because many parents came to support with tailgates full of fried chicken, burgers, and Costco cheese plates. While women skiers won slalom and ladyboards won GS, some would say the biggest win of the day was our UVA basketball team beating Duke on the road, and afterwards gloating to all Duke skiers in the general vicinity. Our men skiers came in 2nd for slalom and GS, and manboarders earned 4th for GS. And we're back to our favorite Motel 6 in Mount Jackson, Virginia! Inexcusable amounts of Sheetz and Denny's may have done us dirty, but it definitely didn't show in this weeks results. Our first weekend at the lovely resort of Bryce included two days of GS for skiers and GS and slalom, a relatively new endeavor, for our boarders. Men's skiers earned 4th both days, with captain Jimmy Waldo winning on the second day! Women's skiers improved from 3rd on the first day to 2nd the next, with another win by 4th year Haley Hopkinson. Nan Sowers lead the ladyboarders swept 1st (again, they rock) in GS and 2nd in slalom, and manboarders nailed 2nd for both. Special shoutout to even more parents who came to watch and feed us, we love you! Thank you all for an incredible season, and look out for results as we head to our USCSA Regionals competition this weekend! Thank You UVa Parents Fund!!! A HUGE thank you to the UVa Parents Fund for the greatest gift of all this season: new speed suits! Not only were we faster and safer this year on the slopes but we looked pretty awesome too ;) We are so thankful to have such awesome gear to race in and it definitely showed in this season’s results. At our first race at Sugar Mountain, our lady skiers got first in GS and first again at our Beech Mountain race. Also, at the Bryce dual slalom race, men’s captain Jimmy Waldo took first! Again, thank you so much for being such great sponsors!!! Feeling in a generous mood lately?? Have some gently used coats, clothes, hats, or scarves you want to donate? Hmm sounds like you should donate to the VASST winter wear drive! We’ve already gotten a bunch of donations so far because you guys are awesome ;) so keep them coming! Boxes are outside Blau Haus (201 14th St NW) and Lawn Room 21! This past weekend, VASSTers from all over the country skied and boarded back to grounds to hang out with their ~favorite~ club for old times sake. Stoops were danced on and massive group photos were taken, so it’s safe to say Homecoming weekend was a success! A special shout out to president Alex Lupi for letting us use his lawn room to throw the greatest Guactober party of all time (yes we made Guacamole and October into a word). Better yet, there was pancake flipping for Pancakes for Parkinson’s to benefit the Michael J. Fox foundation! And that’s a wrap! With four races in four weekends, UVA is done competing in the USCSA Southeast Conference and is off to the Mid-Atlantic Regionals this weekend. But before looking ahead, let’s look back on those four races, and the beautiful memories they now hold. It was muddy as a duck puddle, frustrating shredders across all disciplines as they came out for the first race of the season. As far as steez goes, Sugar was not that sweet. Hey at least they maintained a solid one-to-one ratio (half snow, half dirt). I have to say I don’t know too much about what went on at this one. I wasn’t there, but apparently one kid ordered three quesadillas at Denny’s...for breakfast. That must have sat well during a slalom race. Another notable event was the spontaneous creation of an amateur skateboard club, which Zach hated on, joined, became president of, was kicked off of, and then once again joined, all in the span of about an hour. I don’t think the club exists anymore; snowboarding honestly takes priority over skateboarding, and the exec board didn’t really seem to agree on anything, especially their opinion of Zach. 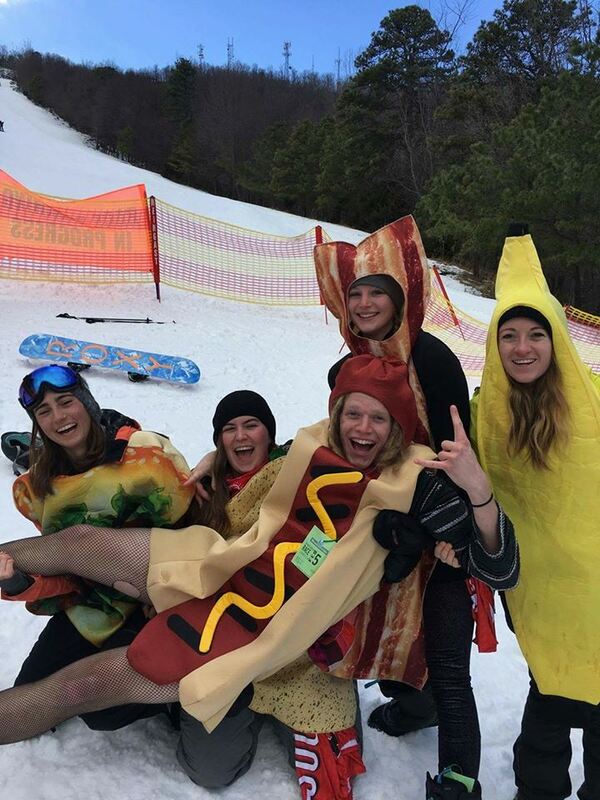 The rail jam on Saturday had the lady boarders uniting and standing up for their right to functional features after heavy usage of one particular butter box left a gaping hole at the end of it. No one knows this better than Caroline, who caught the toe edge of her board in the hole while completing an otherwise gnarly boardslide, and was consequently sent flying like a scorpion into the snow. Yeesh. Mention it to her and she'll show you the whole video. Citing safety concerns and corruption (maybe? ), several lady boarders spoke out. “We stand in solidarity, as #womenagainstthefirstbox,” said Chandler, one of the movement’s leaders, and one of the box’s victims. Despite what Chandler said to the public, she could be seen on the day of the rail jam getting pretty friendly with the butter box, as photographic evidence shows. One source even stated, under the condition of anonymity, that they overheard her whispering, "my precious," as she fifty-fiftied the feature. This past weekend’s race at Massanutten closed out the 2017 regular season. 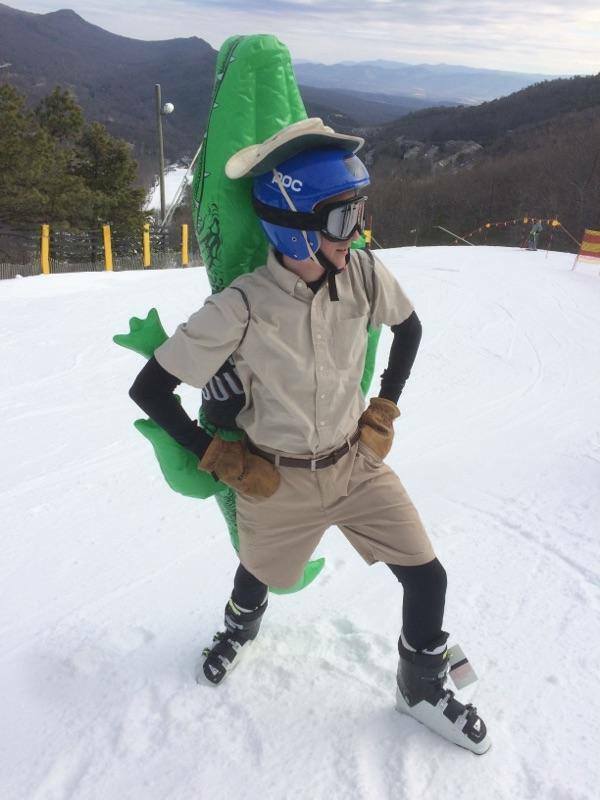 While luxuriously warm and bereft of any real snow, VASST maintained a strong showing and a positive attitude, especially by showing up in costume to giant slalom. Steve Irwin was there, along with several animals, a pikachu, and enough food to go around. Wow. UVA is like totally awesome at everything! ALDERMAN LIBRARY - I hope this blog finds everyone alive and in a cozy study spot. In these next trying days of academic hell, I thought I’d offer some solace with a pro/con list of the current situation, just to put this all into perspective. Things might not be as bad as they seem, or if you are a horrible procrastinator then maybe they are, maybe they are worse. PRO: It’s like, almost cold in Virginia, which is a promising start to Winter! Yay! Like I said, almost cold. CON: Haha..finals, there is no way around them. PRO: They only last two weeks. And while your finals may have failed you, or you may have failed your finals, time has never failed any of us. It will keep on ticking closer and closer to…the best week of the year: Sunday River. Mac's pretty proud of himself for this one. PRO: Skison (ski season for you plebs) begins RIGHT AFTER SUNDAY RIVER with our first race at Sugar Mountain (Oh la-la). Sugar Mountain may sound like a board game, or a level of Candy Crush, but in fact it is actually a ski resort - the more you know. Remember everyone, there’s a reason we do what we do, and that reason is skison. This past Monday, tykes from all over Charlottesville hit the lawn in costume to celebrate Halloween--UVA style. And guess what, VASST was there! A quick thank you to Grant Schwooby Dooby Doo for your lawn room (fyi Grant there are rumors that you perform spooky Argentinian folk rituals in there, but I don't spread rumors so I thought I'd let you know directly- I've got your back). even if it's for only once in their life. Check out Gallery for more podium pics!